Physical characteristics: Greater roadrunners are ground cuckoos, terrestrial birds that live primarily on the ground. They rarely fly, traveling on their sturdy legs instead of using their wings. Birds can fly for a short distance and will do so when in danger or traveling downhill. The roadrunner's head-to-toe length is 22.1 inches (56 centimeters) long. The white-tipped tail accounts for about half of that length. Male roadrunners weigh 0.64 pounds (320 grams). Females weigh about 0.58 pounds (290 grams). Their plumage is black, white, and brown. Geographic range: Greater roadrunners live in Mexico and the southwestern United States. Habitat: Greater roadrunners live in the dry brush and scrub in the Mojave (moe-HAH-vay) and Sonoran deserts in the United States. Diet: The greater roadrunner is an omnivore, which means one that eats both meat and vegetation. The bird is fast enough to catch lizards, snakes, spiders, insects, birds, and rabbits. The roadrunner is among the few animals that hunt rattlesnakes. The bird moves so quickly that it can grab the snake by the tail. The roadrunner holds the rattler in its mouth and shakes it, hitting the snake's head on the ground until it dies. The roadrunner then swallows its prey. The roadrunner's diet changes in winter when there are fewer animals in the desert. The bird will then eat plants. 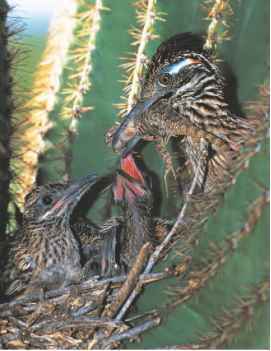 Behavior and reproduction: Roadrunners are monogamous and mate for life. They live in pairs and breed in the spring. The male and female gather sticks and twigs for the birds' nest. The female builds a flat nest in a cactus, tree, or shrub. She then lays from two to twelve eggs. Laying eggs may take up to three days. 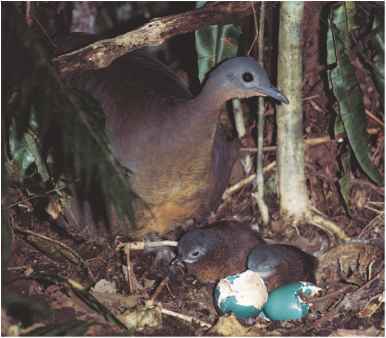 Both parents incubate the eggs; the male usually sits on them at night. The incubation period lasts from eighteen to twenty-one days. Eggs don't hatch at one time, and a week may pass between hatchings. Rain and food supply influences breeding patterns. Birds in California's Mojave and Sonoran Deserts breed only in the spring. Summer rains in the Arizona portion of the Sonoran increases the food supply, and birds breed in August and September. Greater roadrunners and people: Greater roadrunners face the risk of being struck by vehicles as they run along desert roads. Stuart, Chris and Tilde. Birds of Africa, from Seabirds to Seed Eaters. Cambridge, MA: The MIT Press, 1999. Wade, Nicholas, ed. The New York Times Book of Birds. New York: The Lyons Press, 2001. The Bird Site, Los Angeles Natural History Museum. http://www. nhm.org/birds/guide (accessed April 25, 2004). "Avian Orders: Cuculiformes." BIRDNET. http://www.nmnh.si.edu/ BIRDNET/ORDERS/Cuculiformes.html (accessed May 8, 2004).